In Colleen Blackard’s universe, everything is illuminated. 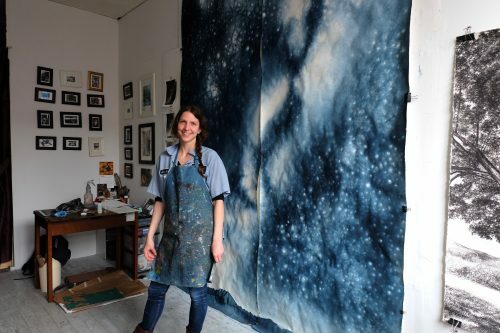 Her photorealistic artwork is a deep dive into personal experiences—real or imagined—that transcend time and space. Through detailed monochrome imagery created with ballpoint pen, marker, ink wash, or monotype, we get a glimpse into her world, which moves between feelings of pain, abandonment, renewal, and reconnection. 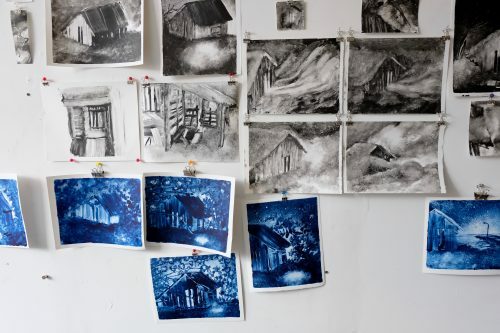 “The way I draw is to follow the light… to see where it leads,” she says. For years, Colleen spent long meditative hours drawing circles to capture the inner glow of her subjects and to reveal the light within. “Circles are so expansive. They create more space than you’d expect from a tiny little region.” In a close-up view of her work, you see meticulous coils of tightly drawn lines that make up the resultant photorealistic images. 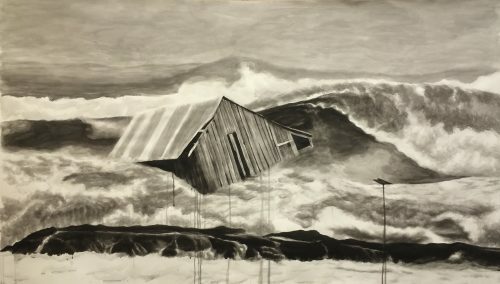 While they range from scenes in nature to portraits, recurring motifs of the sky, water, and a decaying barn manifest an undercurrent of emotions derived from her earliest memory of pain. The Abandoned Series tells the story of Colleen’s struggle with feeling disconnected and abandoned when her sister was born. 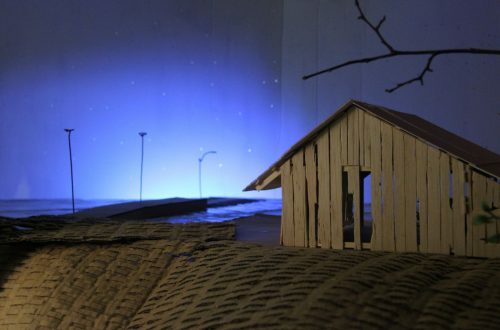 A lonely old barn in various settings personifies the experience of confusion and resolution as she finds her way to reconnection. 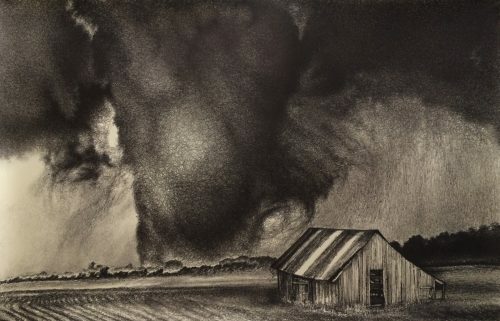 In “Fate,” an ominous tornado looms in the distance, while in “Release” the barn is engulfed by a turbulent sea storm. The different expressions of fear and sadness in the two pieces also show the evolution of Colleen’s technique from a more methodical constricted style using archival marker to a more looser, fluid style where drips of India Ink are reminiscent of tears. 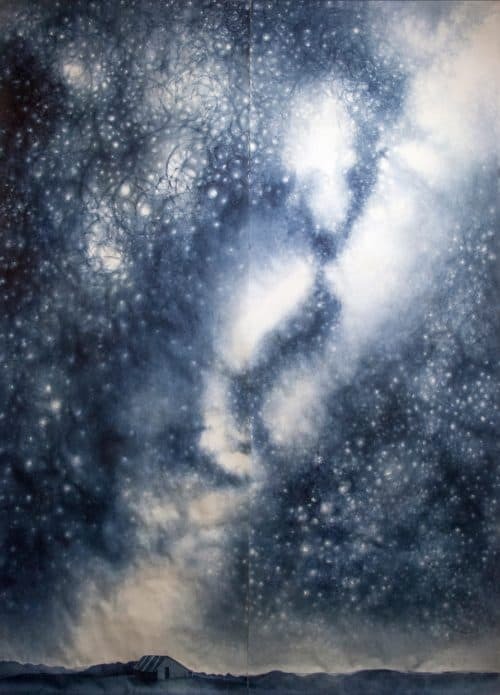 A large-scale ten-foot-tall piece (which took two years to create), “Important” is where the two styles converge and the barn is at rest under a beautiful expansive night sky, full of stars glowing through infinite layers of Colleen’s signature bold abstract circles in blue ink. Learn more about Colleen Blackard’s work and see how her story continues to unfold on her website, Instagram, and Facebook.